I used to live in North California, close to San Francisco to be exact, so I love that BREATH OF EARTH is set in my old stomping grounds. I could easily see Ingrid Carmichael and the rest of the Wardens running the city. I love how diverse BREATH OF EARTH is. The Asian infusion is on point and was done in a very respectful manner. I say respectful because Beth Cato deviated from the stereotypes and instead highlighted traditions and cultural aspects that gave the story a different feel. BREATH OF EARTH is very plot driven yet it told more than it showed. I wanted to see more of how these geomancers wield their power through showmanship via confrontations or fights. Ingrid Carmichael, though an interesting heroine, isn't what I expected her to be. Ingrid is supposed to be a very powerful geomancer and yet her character is very understated in that she's more of a follower than a hero. I also found it a little confusing that Ingrid didn't exercise much of her abilities when she's been pseudo training for years. There's a lot of politicking involved which is basically the main conflict of BREATH OF EARTH. I love the intrigue, but as I've mentioned, I wish this debut is more action driven. Style-wise, I am a big fan of BCato's writing style. I love how the scope encompasses the world she created versus painting it just from the hero's POV's. We get a good feel of what the world looks like with geomancers out and about causing volatility in the world. Earthquakes and natural disasters are imminent depending on which geomancer is in town and what said person is feeling. The world building is well defined, BCato painted a vivid world said in a very simplistic manner. 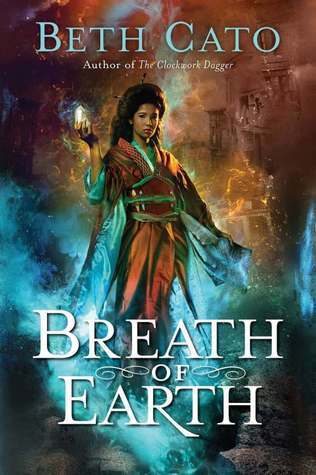 BREATH OF EARTH is a cool debut to an equally cool and interesting series. I admit I wasn't wowed by it the same way as BCato's other steampunk series, Clockwork Dagger, yet I'm curious enough to follow the series and see where Ingrid and the rest of her geomancer posse will lead the tale. I almost added this to my tbr, but I wanted some more opinions. I'm definitely willing to give this a shot, even if you weren't wowed by it. Great review! I love the pic, but not sure I would pick up😏😏I agree. When we can really relate to a place we have lived or visited, it makes the story more real. Hugs and happy Sunday! Well, I hope you'll enjoy the rest. I'm glad this one whetted your appetite despite not having enjoyed it fully. I would love to try this one out for the San Francisco setting, but like what you mentioned, I'd probably want more action too. Great review! Great review. Can you believe that I haven't read a steampunk? I keep saying that I'm going to and have just never gotten around to it. I love a good CA setting. This sounds like it's a good start to a promising series, despite the issues. Oh this sounds like something I would love! I also like how you mentioned the romance isn't heavy!